A magnet levitates above a high-temperature superconductor (with boiling liquid nitrogen underneath). The levitation indicates that the superconductor expels an applied magnetic field, a property known as the "Meissner effect." Superconductivity, discovered in 1911 by Heike Kamerlingh Onnes, is a phenomenon occurring in certain materials at extremely low temperatures (on the order of −200 degrees Celsius), characterized by exactly zero electrical resistance and exclusion of the interior magnetic field (the Meissner effect). Materials with such properties are called superconductors. Superconductors are used to make some of the most powerful electromagnets known to man, including those used in MRI machines. They have also been used to make digital circuits, highly sensitive magnetometers, and microwave filters for mobile phone base stations. They can also be used for the separation of weakly magnetic particles from less magnetic or nonmagnetic particles, as in the pigment industries. Promising future applications include high-performance transformers, power storage devices, electric power transmission, electric motors (such as for maglev trains), and magnetic levitation devices. The electrical resistivity (the measure of how much a material resists an electric current) of a metallic conductor decreases gradually as the temperature is lowered. However, in ordinary conductors such as copper and silver, impurities and other defects impose a lower limit. Even near absolute zero, a sample of copper shows non-zero resistance. The resistance of a superconductor, on the other hand, drops abruptly to zero when the material is cooled below a temperature called its "critical temperature"—typically 20 Kelvin (K) or less. An electrical current flowing in a loop of superconducting wire will persist indefinitely with no power source (provided that no energy is drawn from it). Superconductivity occurs in a wide variety of materials, including simple elements like tin and aluminum, various metallic alloys, and certain kinds of ceramic materials known as high-temperature superconductors (HTS). Superconductivity does not occur in noble metals like gold and silver, nor in most metals that can be spontaneously magnetized. In 1986, the discovery of HTS, with critical temperatures in excess of 90 K, spurred renewed interest and research in superconductivity for several reasons. As a topic of pure research, these materials represented a new phenomenon not explained by the current theory. Also, because the superconducting state persists up to more manageable temperatures, more commercial applications become feasible, especially if materials with even higher critical temperatures could be discovered. Superconductivity was discovered in 1911 by Heike Kamerlingh Onnes, who was studying the resistance of solid mercury at cryogenic temperatures using the recently discovered liquid helium as a refrigerant. At the temperature of 4.2 K, he observed that the resistance abruptly disappeared. For this discovery, he was awarded the Nobel Prize in Physics in 1913. In subsequent decades, superconductivity was found in several other materials. In 1913, lead was found to be superconductive at 7 K, and in 1941 niobium nitride was found to be superconductive at 16 K.
The next important step in understanding superconductivity occurred in 1933, when Walter Meissner (1882-1974) and Robert Ochsenfeld (1901-1993) discovered that superconductors expelled applied magnetic fields, a phenomenon that has come to be known as the "Meissner effect." In 1935 F. and H. London showed that the Meissner effect was a consequence of the minimization of the electromagnetic free energy carried by superconducting current. In 1950 Lev Landau (1908-1968) and Vitalij Ginzburg (1916 - ) formulated what came to be called the phenomenological Ginzburg-Landau theory of superconductivity. This theory had great success in explaining the macroscopic properties of superconductors. In particular, Alexei Abrikosov showed that the theory predicts the division of superconductors into the two categories, now referred to as Type I and Type II. Abrikosov and Ginzburg were awarded the 2003 Nobel Prize for their work (Landau having died in 1968). Also in 1950, James Maxwell and Reynolds et al. found that the critical temperature of a superconductor depends on the isotopic mass of the constituent element. This discovery revealed that the internal mechanism responsible for superconductivity was related to the attractive force between electrons and the ion lattice beneath—known as electron-phonon interactions. The complete, microscopic theory of superconductivity was finally proposed in 1957 by John Bardeen (1908-1991), Leon Cooper, and John Schrieffer. It came to be known as the BCS theory. Superconductivity was independently explained by Nikolay Bogolyubov (1909-1992). The BCS theory explained the superconducting current as a superfluid of "Cooper pairs"—pairs of electrons interacting through the exchange of phonons. For this work, the authors were awarded the Nobel Prize in 1972. In 1959 Lev Gor'kov showed that the BCS theory becomes equivalent to the Ginzburg-Landau theory close to the critical temperature. Generalizations of these theories form the basis for understanding the closely related phenomenon of superfluidity (because they fall into the Lambda transition universality class), but the extent to which similar generalizations can be applied to unconventional superconductors is still controversial. 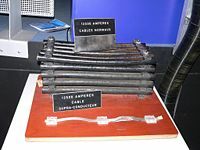 In 1962 the first commercial superconducting wire, a niobium-titanium alloy, was developed by researchers at Westinghouse Electric Corporation. In the same year, Brian Josephson made the important theoretical prediction that a supercurrent can flow between two pieces of superconductor separated by a thin layer of insulator. This phenomenon, now called the "Josephson effect," is exploited by superconducting devices such as SQUIDs (superconducting quantum interference devices). Josephson was awarded the Nobel Prize for this work in 1973. Until 1986, physicists had believed that the BCS theory forbade superconductivity at temperatures above about 30 K. That year, however, Johannes Bednorz and Karl Müller discovered superconductivity in a lanthanum-based cuprate perovskite material, which had a transition temperature of 35 K (Nobel Prize in Physics, 1987). It was soon found by Paul C. W. Chu of the University of Houston and M. K. Wu at the University of Alabama in Huntsville that replacing the lanthanum with yttrium (to make YBCO) raised the critical temperature to 92 K. This latter discovery was significant because liquid nitrogen could then be used as a refrigerant (at atmospheric pressure, the boiling point of nitrogen is 77 K). This is important commercially because liquid nitrogen can be produced cheaply on-site with no raw materials, and is not prone to some of the problems (such as solid air plugs) of liquid helium in piping. Many other cuprate superconductors have since been discovered, and the theory of superconductivity in these materials is one of the major outstanding challenges of theoretical condensed matter physics. Superconductors possess both common and individual properties according to each kind. An instance of a common property of superconductors is that they all have exactly zero resistivity to low applied currents when there is no magnetic field present. Individual properties include the heat capacity and the critical temperature at which superconductivity is destroyed. Most of the physical properties of superconductors vary from material to material, such as the heat capacity and the critical temperature above which superconductivity disappears. On the other hand, there is a class of properties that are independent of the underlying material. For instance, all superconductors have exactly zero resistivity to low applied currents when there is no magnetic field present. The existence of these "universal" properties implies that superconductivity is a thermodynamic phase and that these distinguishing properties are largely independent of microscopic details. Electric cables used by the European Organization for Nuclear Research (CERN). Regular cables (background) for 12,500 amps of electric current used at a particle accelerator called the Large Electron-Positron Collider (LEP); superconductive cable (foreground) for the same amount of electric current used at the Large Hadron Collider (LHC). If the voltage is zero, then the resistance is zero, which means that the electric current is flowing freely through the sample and the sample is in its superconducting state. Superconductors are also able to maintain a current with no applied voltage whatsoever, a property exploited in superconducting electromagnets such as those found in MRI machines. Experiments have demonstrated that currents in superconducting coils can persist for years without any measurable degradation. Experimental evidence points to a current lifetime of at least 100,000 years, and theoretical estimates for the lifetime of persistent current exceed the lifetime of the universe. In a normal conductor, an electrical current may be visualized as a fluid of electrons moving across a heavy ionic lattice (the conducting material), consisting of atoms that are electrically neutral. The electrons are constantly colliding with the ions (electrically neutral atoms) in the lattice, and during each collision some of the energy carried by the current is absorbed by the lattice and converted into heat (which is essentially the vibrational kinetic energy, energy due to motion, of the lattice ions). As a result, the energy carried by the current is constantly being dissipated. This is the phenomenon of electrical resistance. In superconductors, on the other hand, the electronic fluid is not made up of individual electrons, but rather pairs of electrons called Cooper pairs, held together by an attractive force arising from the microscopic vibrations in the lattice. According to quantum mechanics, this Cooper pair fluid requires a minimum amount of energy, ∆E, for it to conduct an electrical current. Specifically, the energy supplied to the fluid needs to be greater than the thermal energy (temperature) of the lattice in order for superconductivity to appear. This is why superconductivity is achieved at extremely low temperatures. In superconducting materials, the characteristics of superconductivity appear when the temperature T is lowered below a critical temperature Tc. The value of this critical temperature varies from material to material. Conventional superconductors usually have critical temperatures ranging from less than 1 K to around 20 K. Solid mercury, for example, has a critical temperature of 4.2 K. As of 2001, the highest critical temperature found for a conventional superconductor is 39 K for magnesium diboride (MgB2), although this material displays enough exotic properties that there is doubt about classifying it as a "conventional" superconductor. 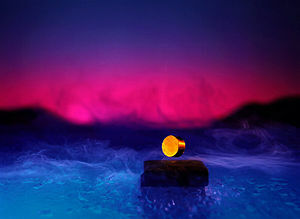 Cuprate superconductors can have much higher critical temperatures: YBCO (YBa2Cu3O7), one of the first cuprate (copper based) superconductors to be discovered, has a critical temperature of 92 K, and mercury-based cuprates have been found with critical temperatures in excess of 130 K. The explanation for these high critical temperatures remains unknown. The onset of superconductivity is accompanied by abrupt changes in various physical properties, which is the hallmark of a phase transition (when a material changes state, such as from solid to liquid). One such change, as seen above with the Cooper pairing, is that the electronic fluid in a normal conductor becomes a Cooper pair fluid in the superconducting state and this fluid also becomes a superfluid. When a superconductor is placed in a weak external magnetic field, the field penetrates the superconductor for only a short distance, called the penetration depth, after which it decays rapidly to zero. This is called the Meissner effect, and is a defining characteristic of superconductivity. For most superconductors, the penetration depth is on the order of 100 nanometers. The Meissner effect states that a superconductor expels all magnetic fields. Suppose we have a material in its normal state, containing a constant internal magnetic field. When the material is cooled below the critical temperature, we would observe the abrupt expulsion of the internal magnetic field. An equation (known as the London equation) predicts that the magnetic field in a superconductor decays exponentially from whatever value it possesses at the surface. The Meissner effect breaks down when the applied magnetic field is too large. Superconductors can be divided into two classes according to how this breakdown occurs. In Type I superconductors, superconductivity is abruptly lost when the strength of the applied field rises above a critical value. Depending on the geometry of the sample, one may obtain an intermediate state consisting of regions of normal material carrying a magnetic field mixed with regions of superconducting material containing no field. In Type II superconductors, raising the applied field past a critical value leads to a mixed state in which an increasing amount of magnetic flux (an amount of something that flows through a unit area in a unit time) penetrates the material, but there remains no resistance to the flow of electrical current as long as the current is not too large. At a second critical field strength, superconductivity is destroyed. Most pure elemental superconductors (except niobium, technetium, vanadium and carbon nanotubes) are Type I, while almost all impure and compound superconductors are Type II. Superconductors are used to make some of the most powerful electromagnets known to man, including those used in MRI machines and the beam-steering magnets used in particle accelerators. They can also be used for magnetic separation, where weakly magnetic particles are extracted from a background of less or non-magnetic particles, as in the pigment industries. Superconductors have also been used to make digital circuits and microwave filters for mobile phone base stations. Superconductors are used to build Josephson junctions, which are the building blocks of SQUIDs (superconducting quantum interference devices)—the most sensitive magnetometers known. Series of Josephson devices are used to define the SI volt. Depending on the particular mode of operation, a Josephson junction can be used as a photon detector or as mixer. The large resistance change at the transition from the normal- to the superconducting state is used to build thermometers in cryogenic micro-calorimeter photon detectors. Other early markets are arising where the relative efficiency, size, and weight advantages of devices based on high-temperature superconductors outweigh the additional costs involved. Promising future applications include high-performance transformers, power storage devices, electric power transmission, electric motors (such as for propulsion of vactrains or maglev trains), magnetic levitation devices, and fault current limiters. However, superconductivity is sensitive to moving magnetic fields, so applications that use alternating current (such as transformers) will be more difficult to develop than those that rely upon direct current. Superconductivity is a popular device in science fiction, due to the simplicity of the underlying concept—zero electrical resistance—and the rich technological possibilities. One of the first mentions of the phenomenon occurred in Robert A. Heinlein's novel Beyond This Horizon (1942). Notably, the use of a fictional room temperature superconductor was a major plot point in the Ringworld novels by Larry Niven, first published in 1970. Organic superconductors were featured in a science fiction novel by physicist Robert L. Forward. Also, superconducting magnets may be invoked to generate the powerful magnetic fields needed by Bussard ramjets, a type of spacecraft commonly encountered in science fiction. The most troublesome property of real superconductors, the need for cryogenic cooling, is often circumvented by postulating the existence of room temperature superconductors. Many stories attribute additional properties to their fictional superconductors, ranging from infinite heat (thermal) conductivity in Niven's novels to providing power to an interstellar travel device in the Stargate movie and TV series (real superconductors conduct heat poorly, though superfluid helium has immense but finite heat conductivity). ↑ A phonon is a quantized unit of vibrational energy produced by the oscillations of atoms or ions in a crystal lattice, such as the atomic lattice of a solid. Phonons play a major role in many of the physical properties of solids, including a material's thermal and electrical conductivities. H.K. Onnes (1911). . Commun. Phys. Lab. 12 (120). W. Meissner and R. Oschenfeld (1933). . Naturwiss. 21 (787). F. London and H. London (1935). . Proc. R. Soc. London A149 (71). V.L. Ginzburg and L.D. Landau (1950). . Zh. Eksp. Teor. Fiz. 20 (1064). E.Maxwell (1950). . Phys. Rev. 78 (477). C.A. Reynolds et. al. (1950). . Phys. Rev. 78 (487). J. Bardeen, L.N. Cooper, and J.R. Schrieffer (1957). . Phys. Rev. 108 (1175). N.N. Bogoliubov (1958). . Zh. Eksp. Teor. Fiz. 34 (58). L.P. Gor'kov (1959). . Zh. Eksp. Teor. Fiz. 36 (1364). B.D. Josephson (1962). . Phys. Lett. 1 (251). J.G. Bednorz and K.A. Mueller (1986). . Z. Phys. B64 (189). M. K. Wu, J. R. Ashburn, C. J. Torng, P. H. Hor, R. L. Meng, L. Gao, Z. J. Huang, Y. Q. Wang, and C. W. Chu (1987). Superconductivity at 93 K in a New Mixed-Phase Y-Ba-Cu-O Compound System at Ambient Pressure. Physical Review Letters 58: 908–910. Kleinert, Hagen. 1982. “Disorder Version of the Abelian Higgs Model and the Order of the Superconductive Phase Transition.” Lett. Nuovo Cimento 35: 405. Superconductor Week Newsletter – industry news, links, etc. ScienceDaily: “Physicist Discovers Exotic Superconductivity.” University of Arizona, August 17, 2006.